The 2017 Toyota Tacoma TRD Pro comes with a lift, upgraded struts, rear locker, center LSD, and specially tuned traction control with what some of us can only imagine is a delightful, 6-speed manual gearbox. Opt for the automatic, and you also get hill-start assist, 5-mode Multi-Terrain Select traction control, and Crawl Control, which is basically low speed cruise control for when things get a bit touch-and-go. You know what makes all this possible? Hundreds—if not thousands—of feet of electrical wiring connecting myriad sensors and servos to a digital, controller area network (ie; CANbus). In other words—computers. There’s a good chance you’re reading this on a small computer that fits in the palm of your hand. It’s probably also a high definition video camera, remote control, virtual assistant, and—haha—telephone. How much better is your life because of this magical ingot of plastic, aluminum, and glass before you? And yet, do you still remember your significant other’s phone number? Your mom’s phone number? How strong are your navigation skills after so many positive experiences with Google Maps? Technology is a double-edged sword. While it can make our lives better. It can also make them tougher. Computer controlled robots enable better build quality at lower, relative prices. Gone are the days of the factory freak, the new car with better than average performance due to an assembly line anomaly. Ask just about any professional auto writer about overall build quality and you’ll discover there is no shortage of anecdotal evidence the auto industry has never been better. Adventurists like us tend to romanticize self-sufficiency. We pride ourselves on our ability to get out and explore remote locations, to provide for our own needs—water, shelter, food—and to apply our skills to the situation at hand. We can start a fire without matches. We can catch food without weapons. We can survive where others can’t. At the same time, we love the latest cutting edge technology—especially when it comes to our machines. That new, top-of-the-line Tacoma? We all want one. Okay. We’d all take one if they were giving them away for free. Toyota has long been synonymous with “off-road ability.” But for all it’s modern bells and whistles, for all it’s technological prowess, it’s still missing something, isn’t it. 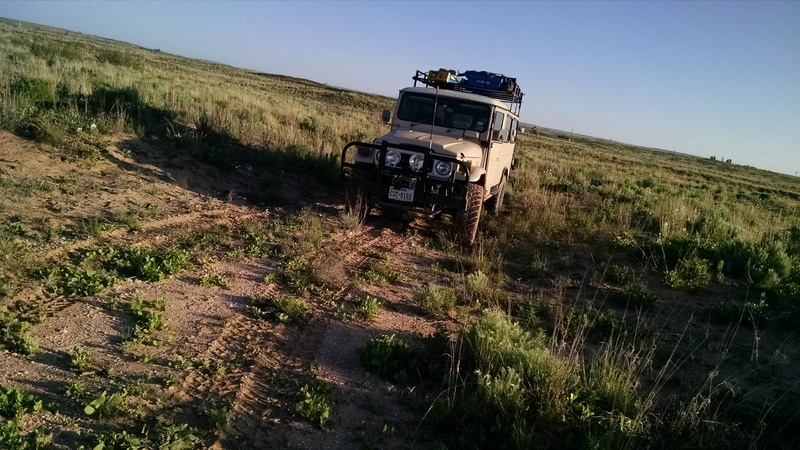 It’s an amazing machine, but does it speak to our sense of adventure like, say, and old Troopy. We look back at the old machines with both deep respect and fondness. Things were simpler then. Your hands and feet were mechanically connected to the bits making everything go, stop, and turn. 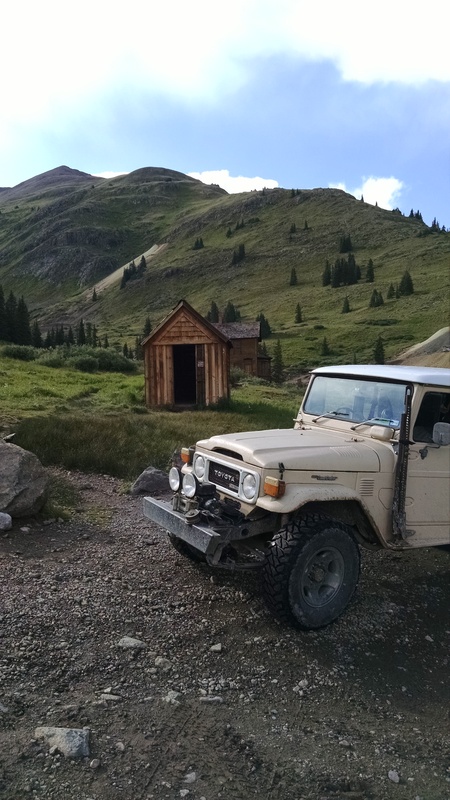 These were the glory days for sure, but we also know why those of us who enjoy exploring primitive roads, cooking over fire, and sleeping in tents aren’t all driving rugged, old vehicles. We like our air conditioning, cruise control, and modern conveniences. 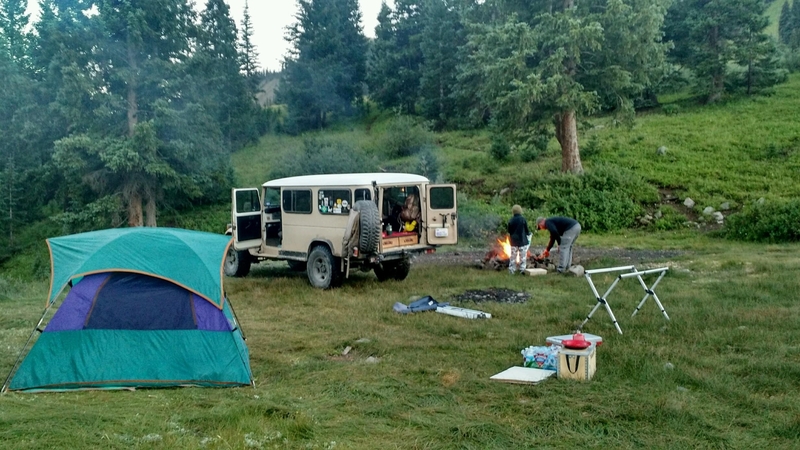 We pride ourselves on “roughing it,” but how rough is relative. Still, we love the old machines. We love the classic lines, the simple systems, and the rugged self-sufficiency they represent. That’s why I was so happy to meet Carter Beckworth. Three years ago, he imported an old Troopy. He went through it with a fine tooth comb, welded in a few new panels here and there, and got it out on the trail where it belongs. It’s not his first Land Cruiser, but it’s his favorite. We had a chat about one of his recent adventures. There’s plenty of stories out there celebrating the elegant simplicity of older machines like your Troopy, but I haven’t seen many about people walking the walk, ya know? It’s one thing to import an old, never-sold-here truck and play with it on the weekend. It’s something else entirely to load up your family and drive off into the mountains with it. [CB] The Colorado trip was a nice one for all of us. We had a blast and saw some beautiful country, did some camping and exploring. 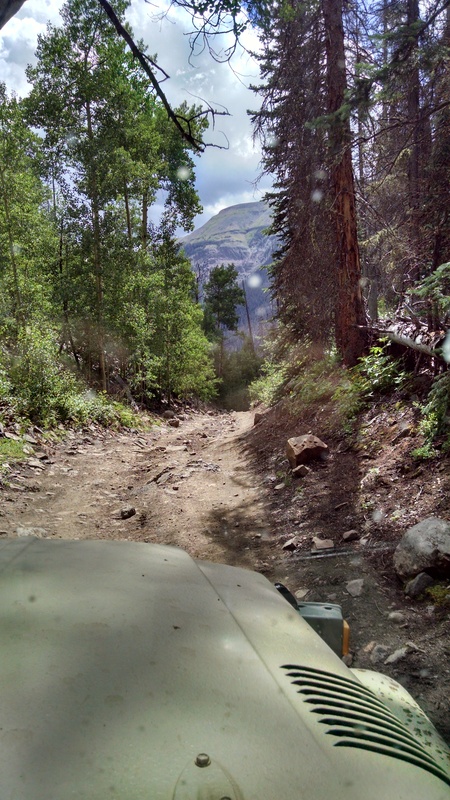 Ran some of the more challenging trails in the Gunnison area and the Alpine Loop near Lake City, and some in the San Isabelle down near Trinidad. 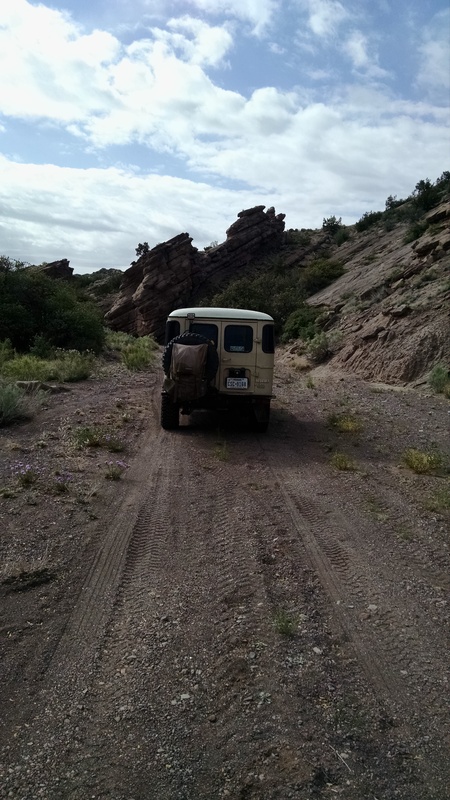 We also found a potential route to get us down into central New Mexico. We ran out of time to try it, but it is on our list. Maybe this winter, while the desert is cool. When we got home, I got a new muffler put on due to rock rash. Also replaced leaf spring bushings that were looking chewed. That is one of the key things in travel with an older truck, but truly it applies to anything—know your rig. Pay attention and do a solid pre-and post-trip inspection. Know the condition of everything that can fail. If something seems iffy, fix it. Right now. Don’t you worry about breakdowns? [CB] When I got my Troopy, I took it apart, checked everything, made adjustments, resealed everything that holds oil, and made improvements as needed. I know what condition everything is in, so why worry? Of course anything can break. Brand new stuff breaks everyday! Dealership shops are full of new, broken cars. Old trucks have soul. That is something you can’t buy or bolt on. It comes with time and miles. Nothing’s better to me than twisting the ignition and hearing the old girl rattle to life at the start of a new journey. 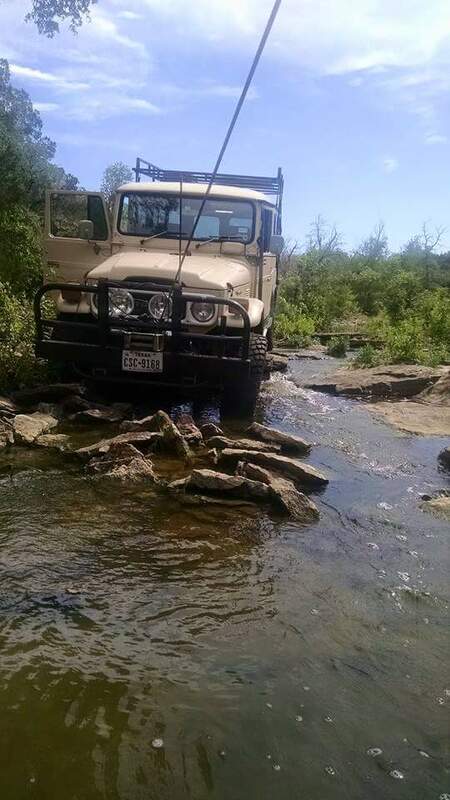 How often do things wear out or require fixing on your Troopy? Can you speak to how that compares with a more modern rig? [CB] I would say the key to reliability in a old rig is to have a known baseline. I wouldn’t recommend going out and buying a 30 year old truck, adding gear and goodies, and hitting the road . That is a recipe for disaster. In the case of my Troopy, I believe it to be reliably equivalent to a 3 year old truck. I brought it in from Australia, took it apart, and started with a known, solid platform three years ago. Everything was taken apart and checked and repaired or replaced as needed. I have total faith in the truck since I know every inch of it and stay ahead of failures. Really, since I got it on the trail, the only stuff that has failed has been trail damage; spring bushings, exhaust parts, the occasional blinker, and an alternator that didn’t like to swim. I expect about a 10 year run with newish reliability. At that point I’ll tear it apart and start over. I’m going through this phase with our old 60 series right now. 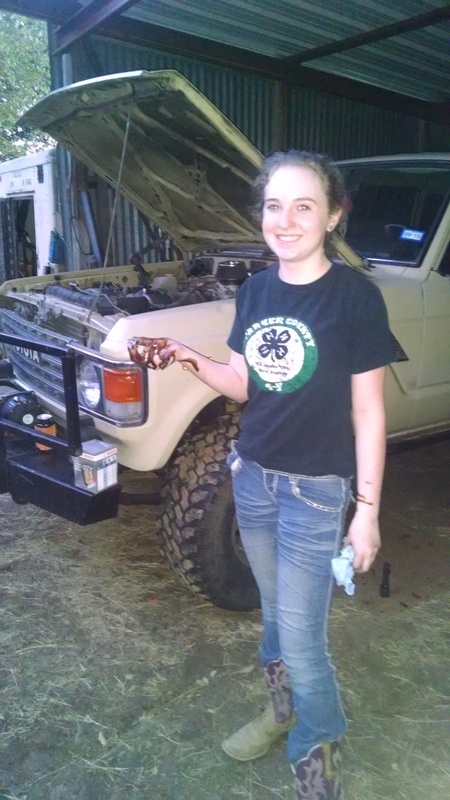 Recently, my daughter and I resealed the axles, transmission, and transfer case. I redid the head and carburetor and re-bushed the springs. 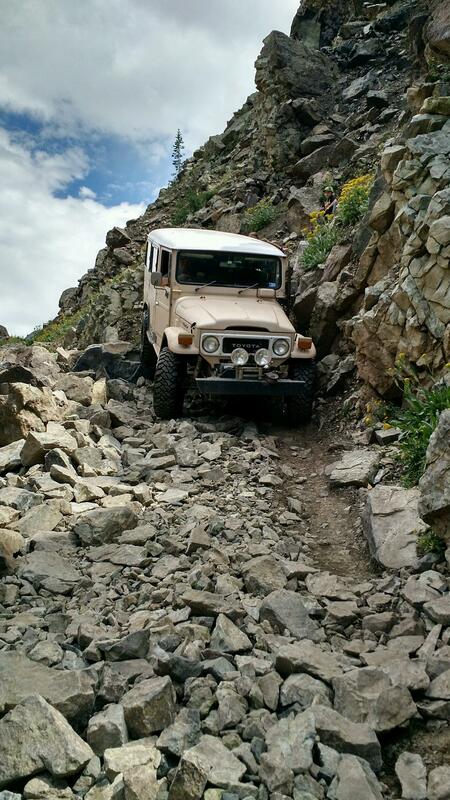 The 60 was our previous overland rig and my wife’s daily driver for about six years. It was starting to need attention, so she got a new Tacoma and our 15 year old got the 60—that she is now helping to rebuild. Once we are done on the 60 should be in good shape for a long time. And my daughter and I will have had a good time and created a stronger bond. As far as compared reliability to a new truck, you are going to spend more time tuning and tinkering on an oldie, but they required more attention than modern cars do anyway, so that really doesn’t count. I’ve been on “expedition” trips where new vehicles didn’t make it due to mechanical failure and my old girl kept on going. Newer vehicles are tech heavy and when they quit you are just done. 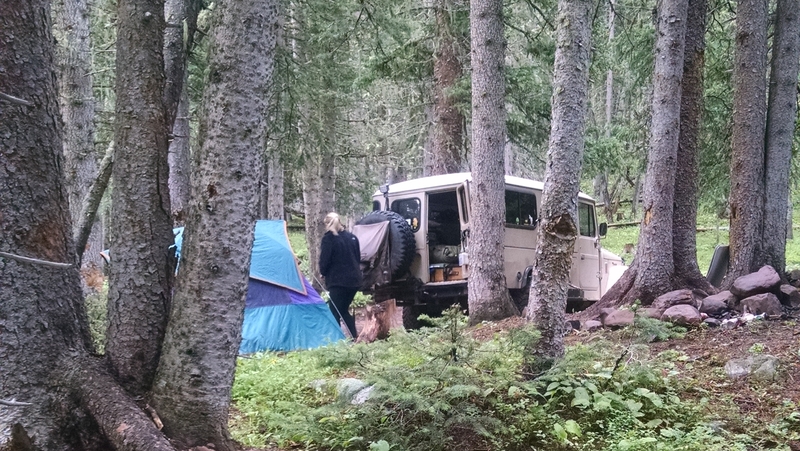 The old rigs can be coaxed along and rigged to get you clear of trouble. I’ll take that over creature comforts any day. I once drove the 60 series 50 miles with a bad fuel pump by pressurizing the fuel tank with my 12 volt air compressor. I don’t have much faith in our Tacoma. Nice truck don’t get me wrong, but it doesn’t inspire me. 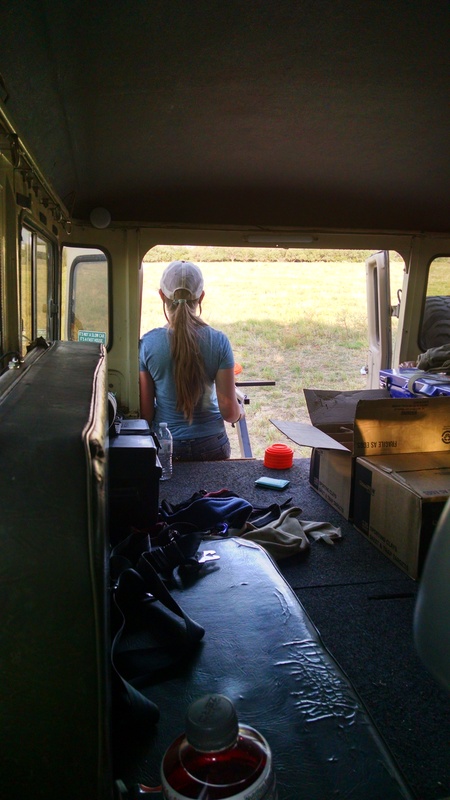 When far off in the backcountry, I’m a nervous wreck with it. I worry about the security system, the battery—why did the AC compressor quit after fording that creek? Will it start tomorrow morning? I don’t have any such worry with my cruisers. I know—short of the engine blowing up—I can get back home. I’ll just McGyver the thing and make it happen. That can’t be done with the new stuff. Too many parts that could fail and leave you stranded. Parts are parts and any can fail. Once you have an old rig squared away, I feel it is just as reliable as a new one if not more so, due to the simplicity of the machine. Thank you to Carter and family for letting us share this conversation! 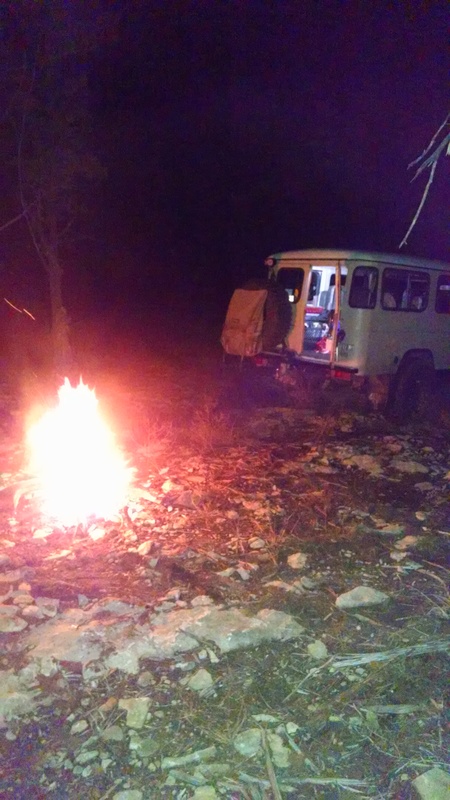 Do YOU have an old adventure vehicle? How does it it speak to you? Ping us and let us know! We’d love to hear more about it. American Adventurist Life empowers our viewers to go confidently in the direction of their dreams. We’re a photography and design rich digital magazine that focuses on adventure experiences; with skill, gear, vehicle, and personality features to compliment those adventures. Inspiring imagery, and editorial which digs deep into the realities of living the adventurist life.